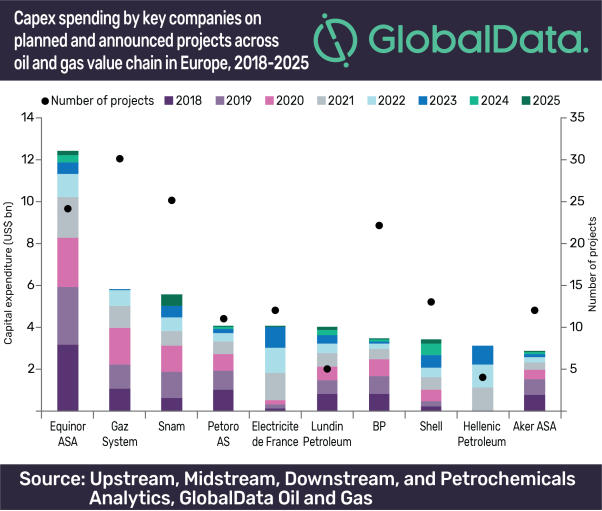 In Europe, Equinor ASA, Gaz-System SA, and Snam S.p.A. are the top three spenders among all oil and gas companies on new build capital expenditure (capex) for planned and announced projects across the oil and gas value chain by 2025, according to GlobalData, a leading data and analytics company. GlobalData's latest report, ‘Top Oil and Gas Companies Planned Projects and Capital Expenditure Outlook in Europe – Equinor Leads Capital Spending Across Oil and Gas Value Chain', reveals that Equinor ASA tops the companies European spend list with an estimated capex of US$12.4bn expected to be spent on 24 projects. Gaz-System SA and Snam S.p.A. are the second and third biggest investors with US$5.8bn (30 projects) and US$5.6bn (25 projects), respectively. With Petoro AS in fourth position with US$3.8bn (7 projects) and Lundin Petroleum in fifth with US$3.7bn (3 projects). In the upstream sector, Equinor ASA has the highest new build capex commitment of US$11.9bn (21 projects) between 2018 and 2025. Gaz-System SA will be the major spender in midstream sector, primarily focusing on oil and gas pipelines with a capex spend of US$5.1bn to bring 29 planned and announced projects online by 2025. In the gas storage segment, Snam S.p.A. leads with estimated capex of US$2.5bn to be invested in 14 planned and announced gas storage terminals by 2025 and International BV will lead with capex of US$0.7bn expected to be spent on Maasvlakte, an upcoming liquids storage terminal in the Netherlands. Grupa Azoty SA is expected to lead the petrochemicals sector to 2025 with a capex of US$748m during 2018–2025. Grupa Lotos SA is at the forefront of gas processing with US$1bn allocated to the Baltic gas processing plant in Poland. In terms of liquid storage, H.E.S. International BV is in the forefront with capex of US$0.7bn expected to be spent on an upcoming liquids storage terminal, Maasvlakte, in the Netherlands.